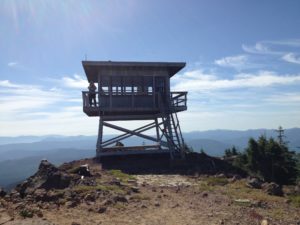 When I wrote about fire lookouts for the Washington Trails Association magazine in 2008, the Evergreen Mountain lookout was one of only two lookouts that guests could rent in Washington. I have climbed to lookouts on Kelly Butte, Oregon Butte, Columbia Peak, Desolation Peak, Red Mountain, Mount Pilchuck, and Heybrook but I had never been to Evergreen. In September, the best season for mountain hiking–no bugs, less heat–I made the trek with a stalwart hiker, photographer, and driver friend. The drive, in my friend’s high-clearance “Beast,” was as much a challenge as the hike–fifteen miles of gravel road, two and a half hours from Seattle to the trailhead west of Stevens Pass. The last nine miles are very narrow, with creek crossings (on bridges or otherwise), sharp drop-offs on the passenger side (don’t look!) and grass growing down the middle track. But it was elevation gain, carrying us up to more than 4000 feet. Driving down, the road didn’t seem so bad, especially since we never met another vehicle, coming or going. (There was one other parked at the trailhead, three young women from Bothell area). 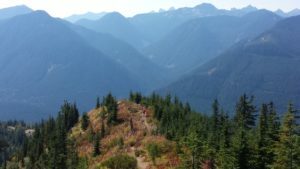 The hike, in September, was gorgeous–a cool, sunny, clear day, ranges and ranges of mountains looking into the Glacier Peak wilderness. Most of the wildflowers, except for pearly everlasting, were past their prime, but the fall reds and oranges complemented the blue sky. It’s a one and a half mile climb, with a brief respite in a saddle. 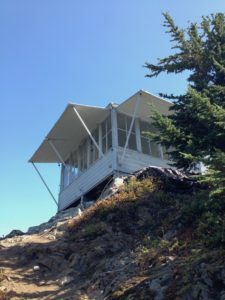 The lookout is undergoing restoration but is listed as available for bookings between August 1 and October 1 most years at www.ReserveUSA.com. The lookout is classic, an oasis of human presence in the Big Sky. 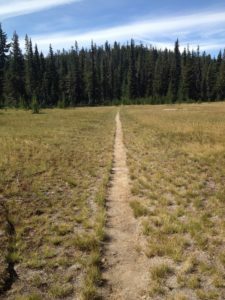 It has been more than ten years since I hiked to Indian Racetrack in the Indian Heaven Wilderness doing “research” for Hiking Washington’s History. The racetrack hasn’t changed, but the approach has. The last time I was there, riders and hikers appeared from the opposite side of the meadow, and now I know how. They came up Trail 171 from FS Road 65 on the west side of the wilderness. I had driven up Road 6048 from the southeast to the trailhead near the Red Mountain lookout. That road is now gated due to frequent vandalism of the lookout. This is the third structure dating from the original in 1910. My hardy Tuesday Trekkers group came up Trail 171 on a beautiful blue sky day in late August after a few days of haze. After reaching the racetrack, which is still a straight line embedded in a meadow, we sat on a skinny log for lunch. The meadow is shrinking as trees encroach, and the old sign proclaiming Klama’t for the racetrack has disappeared, but the feel of a gathering spot is the same. On the opposite side of the meadow, we continued up Trail 171, desserting on abundant huckleberries. Cool breezes mitigated the sun exposure on a mostly bare knoll dotted with balsamroot. Where the trail reaches Road 6048, we walked up to the lookout and luxuriated in glorious views of Mt. Adams, Mt. Rainier, Mt. St. Helens, and Mt. Hood. After three days of hiking around Mt. Adams for our annual retreat, we were sure of our identifications. It’s a wonderful hike, after mosquito season. 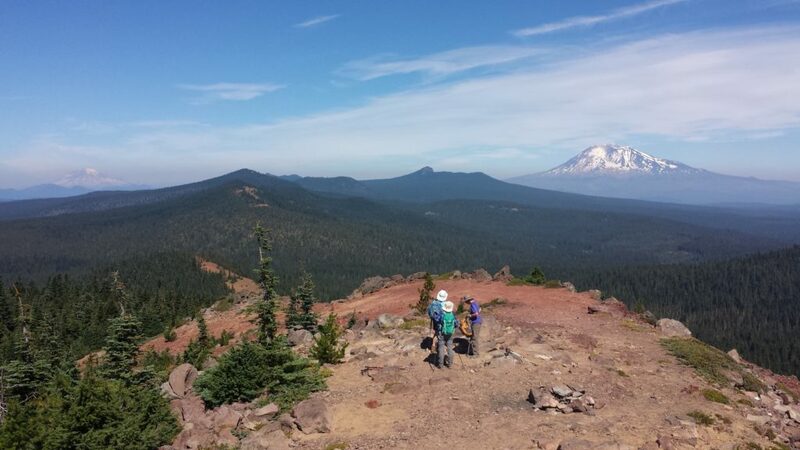 For directions, consult Tami Asars’ Mount Adams and Goat Rocks; for history read the Kalam’t chapter in Hiking Washington’s History.